In 1858 The rectorate was assumed by the Rev. Dr. Joseph Morrison Clarke, who had grown up in Skaneateles, NY. He was ordained in 1852 and while serving as the pastor of St. Peter’s Church in Niagara Falls came to know Dr. Gregory, who recommended him for the upcoming vacancy at St. James. 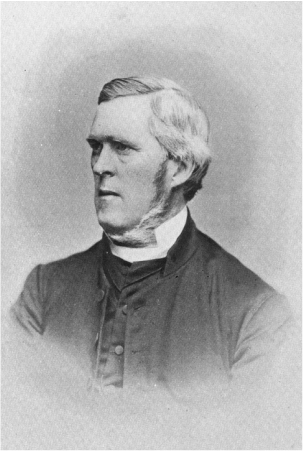 When Bishop Huntington started the second hospital in Syracuse — the House of the Good Sheppard — in 1872, Dr. Clarke also served as one of its chaplains. Dr. Clarke left St. James on October 1, 1886 — the 28th anniversary of his arrival — to accept the professorship of Hebrew and exegesis at the Episcopal Theological Seminary in Nashotah, Wisconsin. Following his retirement in 1891, he returned to Syracuse and became chaplain to Bishop Huntington, a post he held for the remainder of his life. He delivered major addresses at both the cornerstone laying of the new St. James Church and at its opening. Thereafter, he was a regular attendant and frequent speaker among his old congregation. He lived to see it revived as the Church of the Saviour and when he died on November 30, 1899 his body lay there in state.